If money is tight, but your current store fixtures are falling apart, call Easy Rack today and let us help you improve the look, feel, and merchandising power of your showroom with used store display shelves that can be bought at up to 40% less the cost of new store shelving. The point is not to spend a fortune, but to invest enough money in putting your best foot forward for the remainder of the holiday shopping season and the New Year’s sales events. Adding new dimensions, colors, and flexibility to your store displays will bring an entirely new energy to your showroom. No one can guarantee sales in this marketplace, but we can guarantee that quality used store display shelves will get people’s attention and at least make them consider buying the products you go to great lengths to promote. Creativity and customization are the keys to effectively using store display shelving by Easy Rack. Whereas other shelving designs offer a fixed set of dimensions for specific types of displays, our units are different. The only fixed constant in our design builds is the standard 48” horizontal measurement. This standard for base units allows components of larger shelving systems to be quickly repositioned and moved when new layouts are called for. It also allows store display shelves to be used as standalone fixtures. In every other respect, used store display fixtures vary in terms of height, shelf depth, and display color. Smaller store shelving is used to fill gaps along windows and diagonally fit into unused corners. Larger units can be used to create entire wall displays by locking each base unit together with another. You can create any length of aisle shelving or wall shelving you like this way, and you can change it all in just moments simply by removing base units and rearranging them. We recommend that you use store display shelves of varying heights to “mix things up a bit.” Too many shelving units that look exactly the same make it hard for customers to tell where different types of products are located. If you have a pharmacy, for example, you probably have more than just prescription medication. You may carry cleaning supplies, kitchen wares, and even a few toys for children. Using different size display shelving ranging in height from 48” to 84” makes it easy to break up your floor space into different sections, all of which you can of course manipulate at a later date if necessary. Used display shelving that is double-sided is used mostly to create aisles in stores. Single-sided shelving is very useful to fill wall space, corners, and also makes ideal end caps. 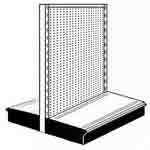 All individual shelves Display shelves are made as either double-sided units re single-sided units. Double-sided units are used to create aisles in the store for the bulk of the inventory to be merchandised. 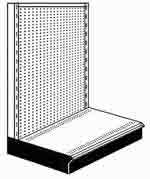 Single-sided store shelving is used a great deal along walls and to make end caps at the end of aisles. Smaller clothing stores also tend to buy a lot of wall shelving to merchandise jeans, shirts, and accessories. Each shelf can be moved up or down at will. It can also be set to a depth ranging from 12” to 22” to allow more light to reach products near the bottom. Because each shelf can support up to 350 pounds, it is no longer necessary for you to limit your best products to the worst spot (on the floor). You can move them up to eye level where they have a much better chance of catching the attention of the frugal buyer.